Add some color with these crafty do it yourself projects. The dip dying trend is still holding strong as it is an easy way to change the look of anything in your home. Completely change the look of your home textiles or clothing with a bit of dye. 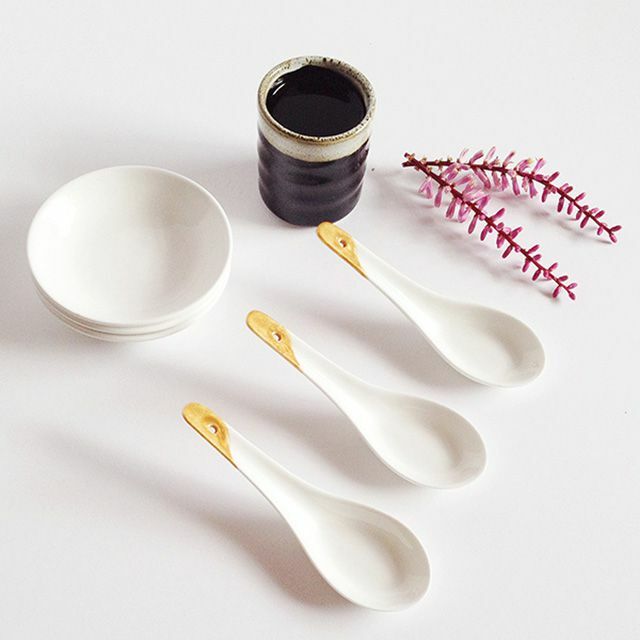 Add some detailing to your asian soup spoons to pick up on the colors found in your dishes with a quick do it yourself project by Make And Tell that takes seconds to do. Dip the end of your spoon into a bottle of ceramic paint to dip dye them. Get ready for your next party by making a set of beautiful colorful napkins that would be perfect for spring and summer celebrations. Using fabric dye and a wet paint brush you can free-hand paint lines on white napkins that will look like watercolor stripes. Protect your table and add beautiful soft colors to your dinner place setting by dip dying your own placemats using pieces of heavy linen and fabric dye in pink and grey. Update one of the baskets in your home by dip dying the bottom of the basket in fabric dye to add a contrasting rich color. Using a mixture of liquid, powder dye and salt in a pot on your stovetop learn how to create the boldest and longest lasting dyed fabric. By twice dip dying your cloth napkins you can create a stunning ombre design you are sure to adore. Learn how to sew yourself an infinity scarf or use a premade white one and tie-dye it to add an eye-catching design perfect to go with all your spring outfits. Get ready for the warm weather by updating your bland white tank tops by dip dying them with a package of fabric dye to add a band of bold color around the bottom of the shirt. Add some rich indigo to your patio by making a set of 6 dinner napkins that will look spectacular at your next BBQ party. To make your own dip dyed indigo napkins you will need an indigo dye kit, 2 yards of linen and a sewing machine. Get the patio ready by updating your outdoor pillows by dip dying them in inexpensive Kool-aid you already have in your pantry instead of typical fabric dyes. Learn about the traditional art of Japanese Shibori typing using indigo and how to use this technique to create a variety of patterned dish towels that you will want to put on display every time guests come over to visit your home. Send beautiful cards or thank you letters using a standard pack of white cards and some food coloring to create a stylish stationery set for a fraction of the cost of stationary sets typically cost.